$3M in SWODF Funding Awarded to London Companies | Mentor Works Ltd.
Six London, Ontario-area businesses serving a variety of industries have recently received Ontario government funding. The development and implementation of the projects awarded will help create and retain jobs within the province, enhance strong economic growth, and support Canadian innovations to stay competitive globally. A combined total of $2,988,874 has been invested into six London businesses through the Southwestern Ontario Development Fund (SWODF). The Southwestern Ontario Development Fund provides small and medium-sized businesses (SMEs), with business expansion funding. This funding helps reduce the costs of developing new infrastructure, facility expansion, purchasing equipment, and investing in workforce growth. The funding will allow the chosen companies to create 283 new jobs and retain 435 existing positions within the province. The six businesses awarded serve a variety of industries including telecommunications, manufacturing, automotive, food processing, and fintech. The companies will embark on strategic growth initiatives with projects such as facility expansions, installation of state-of-the-art equipment, and technology processes to enhance efficiency. Lamko Tool & Mold is a leading manufacturer of high quality molds and specialty dies, including hydroforming. They primarily serve the automotive industry, making plastic injection and compression molds, as well as surface finishing. The province is providing $434,050 in Ontario manufacturing grants to the company. With the funding, Lamko Tool & Mold will be investing in new machinery and facility modifications at their plant in London, Ontario. This will allow them to increase production capacity and meet higher industry demands. This project will create 10 positions and help retain another 79. Sciencetech Inc. designs and manufactures optical spectroscopic instruments, photovoltaic testing equipment, and solar simulators for use in the fields of medical research, biotechnology, space sciences, and analytical chemistry. $161,400 in business expansion funding has been awarded to Sciencetech Inc. The company will be using the business expansion grants to expand its facility and purchase new equipment to increase production of its products. With the support of the Southwestern Ontario Development Fund, this project will create 13 new jobs and help retain 26 positions. Sikorski Sausage Co. is a family-run meat processing facility in London, Ontario, offering over 100 high quality specialty meat products. Their products are sold in grocery stores and delis all over Ontario, and their clients are primarily family-owned European-style delicatessens. Sikorski Sausage Co. is receiving $329,724 from the Southwestern Ontario Development Fund. With the Ontario government funding, the company is expanding its facility and purchasing new state-of-the-art equipment. This will enable them to introduce new ready-to-eat products to the North American market. The project will create 10 positions and retain another 56. Start.ca offers high-speed internet, hosting services, and digital phone operations for personal and business use. $324,700 in Ontario business grants from SWODF are supporting Start.ca’s growth projects. The company is using the business expansion funding to merge operations and move to an 80,000-square-foot facility, which will allow them to increase capacity. The company will also be investing in technology, such as a skill-based routing phone system and a fibre network in London. As well, they are currently building a data center for server hosting. These projects are creating 127 jobs and retaining 117 others. Zomaron Inc. offers e-commerce, payment terminals, POS systems, and stand-alone kiosks for Canadian businesses and industries of all sizes. $239,000 in small business funding grants are supporting the local business. With funding support, the company will introduce a new charitable donations platform called Givepoint. The grants are allowing Zomaron Inc. to introduce Givepoint to the general public and showcase new enhanced features. The project will create 38 new jobs and help retain 50 positions. Hanwha L&C Canada makes HanStone Fine Quartz and solid surfacing solutions for residential and commercial applications, including kitchen countertops, vanities, and flooring. Hanwha L&C Canada has received $1.5M in Ontario business grants. The company will be expanding their facility with the addition of a second production line; this will allow the company to respond to the demand for larger quartz slab sixes and products that are similar to natural stones, such as Calacatta marble. The company is also looking into R&D opportunities to implement a new robotic “drawing machine.” This project is allowing 85 positions to be created and 107 to be retained. The Southwestern Ontario Development Fund offers small business funding grants for economic development and the expansion of SMEs located in the southwestern Ontario region. Funding can be used to support projects that involve developing skills, purchasing new capital equipment, building new infrastructure, enhancing productivity, and creating new jobs within the province. By applying for the Southwestern Ontario Development Fund, businesses may leverage up to 10-15% of project expenses to a maximum $1.5M in business expansion grants. To access SWODF funding, companies must develop a competitive application that details the project’s purpose, budget, timelines, and expected outcomes. The Ontario government funding program is open year-round and is currently accepting submissions. 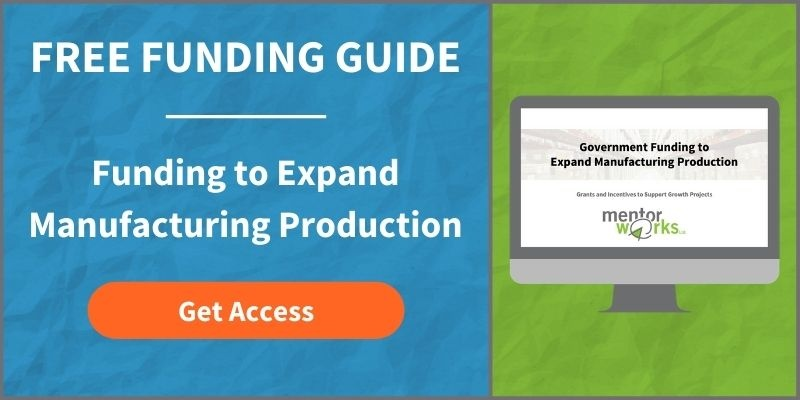 To learn more about the types of projects eligible for SWODF funding and how to support strategic growth projects, download the Key Tips: Expanding Production in Canada slide deck.